The Catskills have a new distillery: Union Grove Distillery, owned by Todd Pascarella and Brian Mulder, celebrated its grand opening on Wednesday, Feb. 10 with a ribbon cutting in the Delaware County hamlet of Arkville. The distillery's first product is Vly Creek Vodka, which is made with wheat and locally grown apples that were pressed in an antique cider press at the nearby Hubbell Family Farm last fall. Mulder and Pascarella have longterm plans to add bourbon and whiskey, products with a long production timeline, to their lineup as well. A crowd of 30 people gathered to celebrate on Wednesday in the distillery's new cocktail lounge and tasting room, which features a cracking wood fire, a copper-topped bar and a kids' room. "The support we've gotten has been unbelievable," Pascarella said. "We're here because of everyone and we're here for everyone." Union Grove Distillery. 43311 Route 28, Arkville. 845-586-6300. uniongrovedistillery.com. 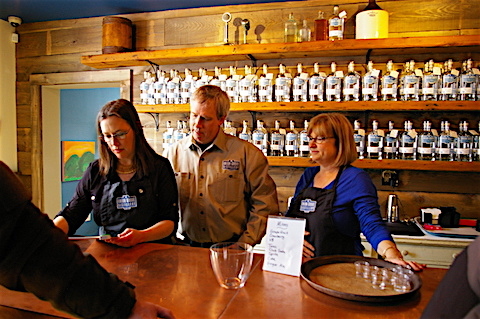 Below: Jeanine Pascarella, Brian Mulder and Penny Mulder behind the bar at Union Grove Distillery on its Feb. 10 opening day.